S 338 x 500px 0.5 Mb. M 676 x 1000px 2 Mb. L 1351 x 2000px 8 Mb. XL 2500 x 3700px 15 Mb. 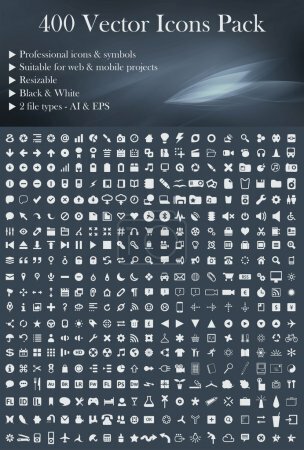 This is a simple, elegant and professional pack of vectorized icons and symbols suitable for your web and mobile projects. They´re 400 pieces easy to color change and resize without lose quality.